/pixels/poll.asp?id=1574' name='vote' target='_blank'>Vote now for your favorite pixelart in this week's challenge! 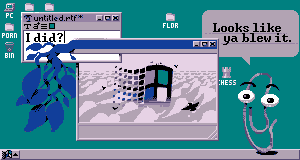 Working on this slightly surreal Win95/98 inspired desktop; I appreciate any type of critique. Hopefully I can finish fixing it up in time for the deadline. that startup screen was noisy as heck !